As a native of Metro Detroit who lived near Wrigley Field in Chicago for about 8 months, I was excited to hear about the opening of Ivy and Coney, a bar that celebrates both Chicago and Detroit, in the Shaw neighborhood of D.C. I had read about this bar being a dive, but that description is too polite. This place is a complete dump. 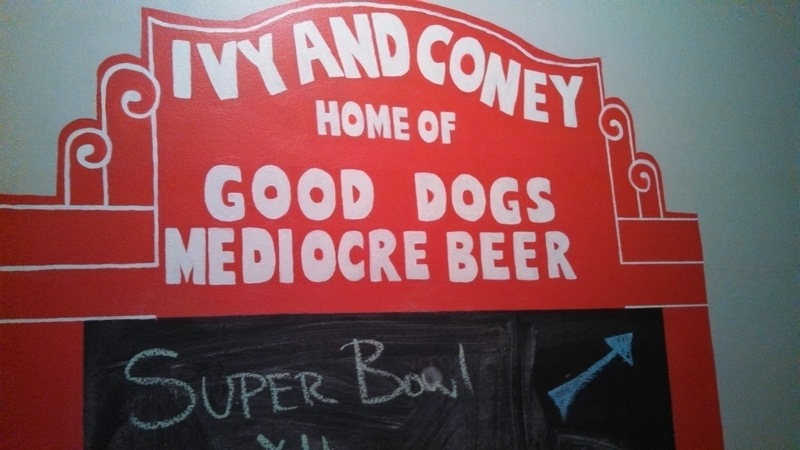 As Stevie Wonder states in an “autographed” photo hanging on the bar’s wall, “Even I can see this bar is a shithole.” However, for this Michigan expat who craves Coney dogs and an unpretentious Midwestern bar feel, it is a wonderful shithole...just like the shitholes back home. My wife and I visited the bar on the Sunday night before President’s Day. 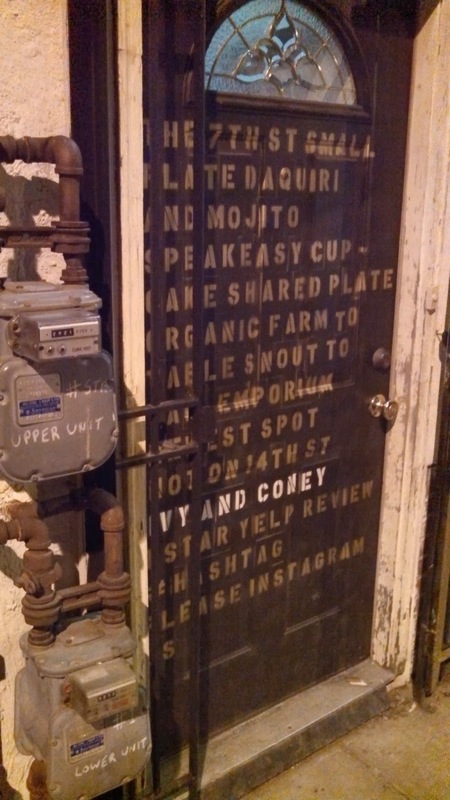 The bar is pretty much unfindable unless you are looking for it and have the exact address. Even with the address, we drove by twice before I stopped the car, got out, and tried the disheveled door of what appeared to be an abandoned storefront. The door opens to a dark entryway with a stairway that ascends to what I could only hope was the bar. Looking to the left I noticed a sign that is shaped like the famous marquee outside Wrigley Field with the words "Ivy and Coney Home of Good Dogs Mediocre Beer" When I went back out to let my wife know that this was the right place, I looked more closely at the outside of the door and noticed the words “Ivy and Coney” buried in a display of random words on the door. As we ascended the stairs we passed a quote from D.C. native and Motown star Marvin Gaye: “Detroit turned out to be heaven, but it also turned out to be hell.” As someone who defends Detroit on a daily basis, the “hell” part made my hairs bristle, but I knew this place is supposed to celebrate Detroit, so I gave the quote a pass. 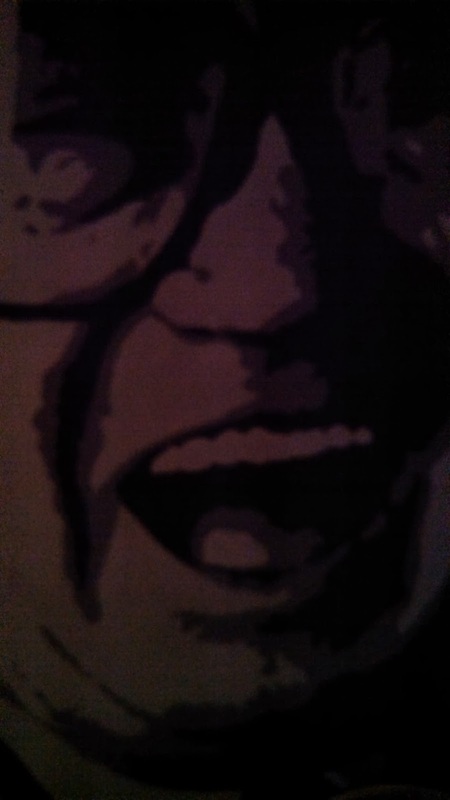 Continuing up the stairs, we passed a map of the Chicago ‘L’ system and found a mural of the eternal voice of the Cubs, Harry Caray, staring at us at the top of the steps (although if you are going to honor Harry Caray, how could you not have a mural of the eternal voice of the Tigers, Ernie Harwell??). To the right of the top of the stairwell is a small room with several seats around a modest bar, and just a few tables. The room is dimly lit by small lamps covered by lampshades painted with images of Detroit and Chicago. A single television hangs above the bar, and on this night it was showing the replay of an Olympic hockey game. Photos of famous and infamous Chicagoans and Detroiters line the walls, like Kwame Kilpatrick, Rod Blagojevich, multiple sports figures, and Kid Rock. Random sports memorabilia from the two cities’ teams also line the walls. 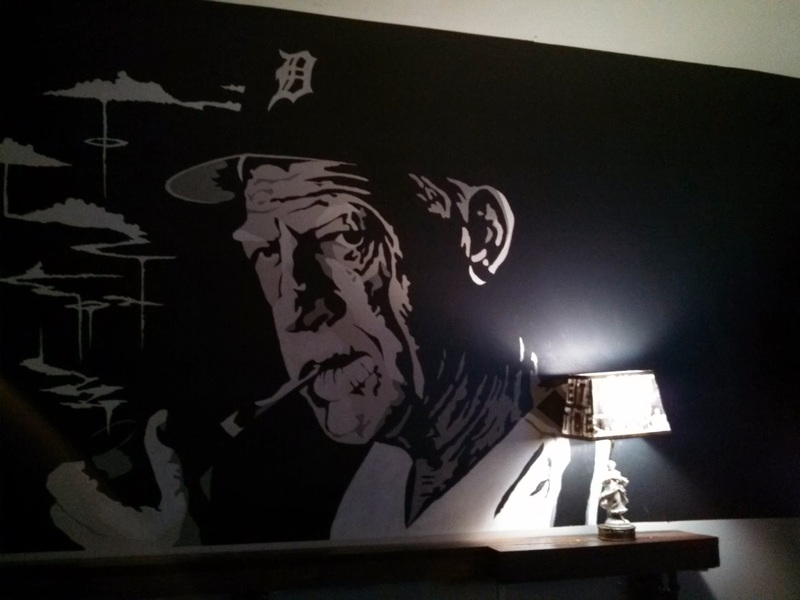 The highlight for this Tigers fan is the giant mural of the great Sparky Anderson that is on the wall across from the bar. A smaller room to the left of the bar and past the the restrooms (which are entertaining on their own for the Detroit and Chicago-related graffiti) has sofas, more memorabilia on the walls, and another television. Continuing with the sports theme, the menu across from the bar is shaped somewhat like the scoreboard at Wrigley Field, with the American League side indicating the food and drinks from Detroit and the National League side representing Chicago’s offerings. 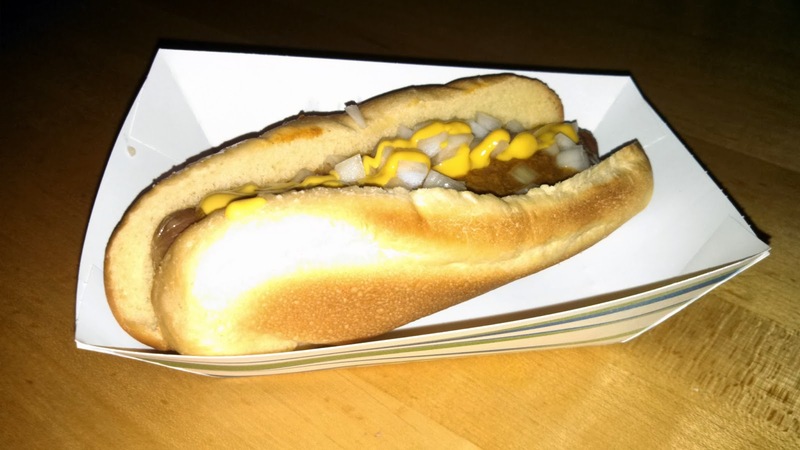 For $4, food patrons can choose a Coney Dog from Detroit or a Chicago Dog (the Chicago also comes in a veggie dog version). They serve peanuts for free, and the shells are littered across the floor, adding to the neighborhood dive bar feel. Finally, they serve Cracker Jack for a few bucks. Michiganders will be happy to know that they serve Faygo (which is a rare find out East) and Vernors (two famous Michigan pops...don't call them sodas). As for beer, Detroit is represented by Stroh’s and Bell’s Two Hearted Ale, while Chicago is represented by Old Style and Goose Island 312. They also serve a limited selection of “booze.” Regular customers also can rent one of the liquor lockers behind the bar and store their favorite alcohol. 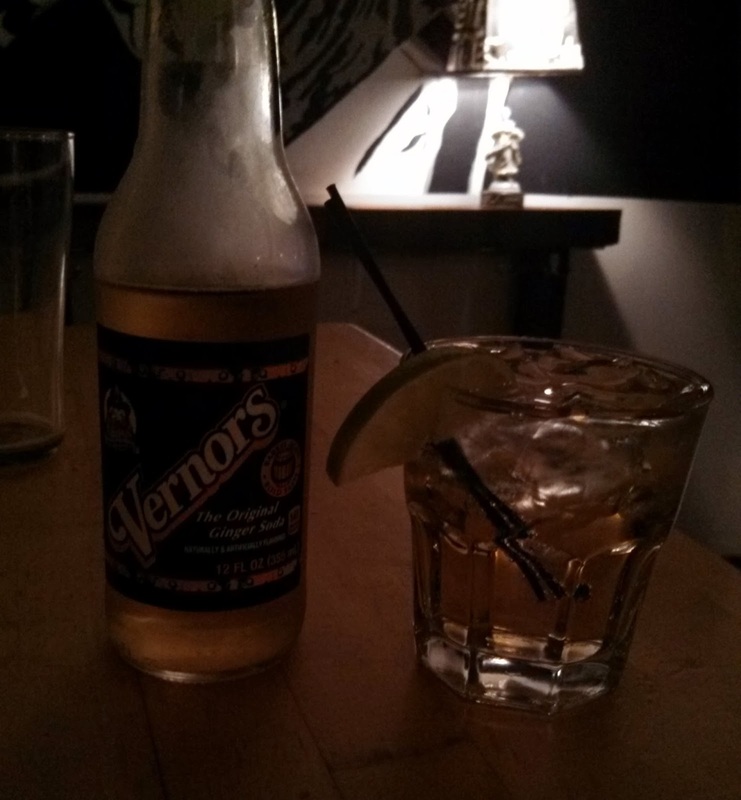 Do not expect the bartenders to serve fancy mixed drinks…although they did make a very mean (read: lots of alcohol) gin and Vernors for my wife. With the first round of drinks, I ordered a Coney Dog. The Coney was delicious and authentic, but it did not overflow with chili like the Coneys at Lafayette Coney Island in Detroit. It was not the best Coney I have had, but it was good enough to order a second. However, my wife convinced me to get a Chicago Dog to be fair. The Chicago Dog was very good as well, and the hot peppers were extremely hot and juicy…do not touch your eyes after eating this dog. In the end, I thought the Coney Dog was better, but I am biased. However, I did overhear a patron, who was not from either city, tell the bartender that the Coney Dog was better, so I guess that scientific survey decides the matter. 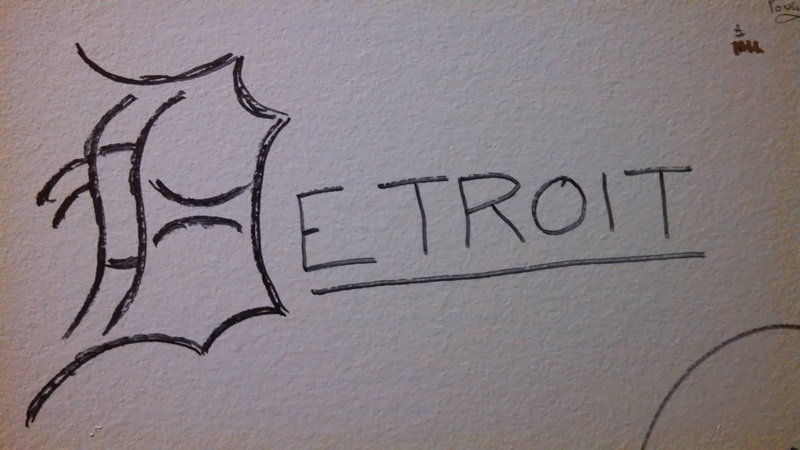 Detroit wins...again! The only thing that could make this place better would be pitchers of beer like we have back in the Midwest, but which are extremely rare in the D.C. area. I also would love if they were open during the day for people who want a quick and cheap lunch. I would highly recommend this place to Detroiters and Chicagoans who miss home and anyone who does not need a pretentious velvet rope bar scene and just wants to sit down, drink a few beers or some booze, and watch a baseball or hockey game.